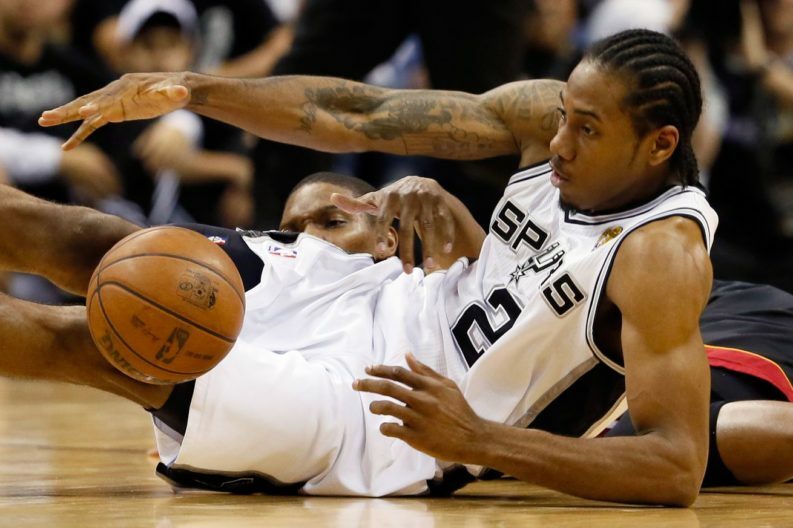 Open Thread: From the supermax to vet minimum, where will Kawhi Leonard land? Not so long ago, in a galaxy circumscribed by Loop 1604, Kawhi Leonard was the 2014 NBA Finals MVP. He followed up his rise to the top of the league by quietly shutting down every star player on each of the other 29 squads, and in doing do, receiving back-to-back Kia Defensive Player of the Year honors. For two seasons he was in the top 3 in voting for the prestigious MVP award and before the 2017-18 season started, he was considered the frontrunner to claim the prize. Then quadriceps tendinopathy happened, or so we have been told. Some believe there were issues between the Spurs and Leonard before the injury that caused the best player in the NBA to basically opt out of playing for an entire season. If that is to be believed along with the concept that he and his representation may have sought multiple opinions in order to sit out after he had been cleared to play, then he essentially forfeited the award that would have defined his career. Meanwhile, the Spurs held it together the best they could with LaMarcus Aldridge having a stellar season. They lost the 20-year reign on 50-game winning seasons, but made the playoffs for the 21st consecutive season and stole a game from a listless Warriors team before elimination. By comparison, Isaiah Thomas was riding high on his career just a year and change back. Thomas, the 60th and final pick of the 2011 NBA Draft went about proving his effectiveness despite his diminutive stature. After being shuffled from Sacramento to Phoenix and then to Boston, his light never shone brighter than when he landed fifth in the 2017 MVP race. Fortune gave way to tragedy as Isaiah Thomas suffered a misdiagnosed injury that expelled him from the playoffs and began the decline of his career. Bruno Passos wrote an excellent piece last spring entitled “For Kawhi Leonard, Isaiah Thomas could be a cautionary tale”. Word of Leonard’s injury being the result of a misdiagnosis lead to his choice to sit out the rest of the season and even skip supporting his team during the playoffs. Only later was there reports that Leonard was unhappy and indeed dodging the Spurs brass effectively fueling a rift that to this day only seems to exist from Leonard’s camp and “league sources”. Since his untimely 2017 playoff exit, Thomas has been moved again from Boston to Cleveland, Cleveland to Los Angeles, and just last week signed a veteran minimum to take his talents to Denver. The one-year deal is an opportunity for Thomas to remind the league of what he can bring to a team. At the same time, he must show that he is in the best health and ready to execute. Kawhi Leonard may find himself in the same boat. As of now, the Spurs can offer Leonard the supermax. They already may have. But no one has reportedly seen Kawhi in action. His sources have leaked “full recovery” and some 90+% healthy rumors, but nothing substantiated. Indeed, Leonard may not be healthy. And if he is not healthy, the league will know very soon. If he is, in fact, unable to play when the season starts, his worth may plummet and he may be facing the same sort of “comeback” season that Thomas currently faces. It may seem farfetched, but it is possible that Leonard will be unable to play at the high level basketball fans have come to expect. And any aggravation to the quadricep could quite possibly eventually tear the tendon (similar to what Tony Parker experienced), requiring surgery, rehabilitation, and then time. Although Leonard is twenty-seven years old, time is not necessarily on his side. He has essentially lost a season. If he is not granted or choses not accept the supermax, he is playing out his last secured season. Choosing to sit out, playing reluctantly, or catering too heavily to former injury (especially after being cleared) might leave teams unwilling to make large offers when the 2018-19 seasons closes. Although it is believed the Lakers will welcome him with open arms, they may not have the cap space for a max contract. In addition, they may not need The Klaw as they will spend the season forming around LeBron James and his merry band of ring-chasing hangers-on. They definitely won’t need a player who can only play small sample sizes of games before sitting out and rehabbing. I’m guessing OddSharks isn’t ready to place percentages on it, but believe it or not this season could be tragic for the one-time great player, the “future of the Spurs” if you will. It is quire possible he end up with nothing come next spring, a fate once believed the Spurs would face if they didn’t trade him immediately for parts. Leonard may be faced with having to take a veteran minimum somewhere down the line in order to show 30 NBA teams that he is ready and willing. And that’s something no one has seen for some time now.